There is an awakening that occurs when we are close to those who travel beside us on our journey. Those who have different ways to move – with wings, paws and hoofs. Today, I saw two geese cross a busy Vancouver street. Cars and buses stopped to allow them to meander through our concrete world. Perhaps they have come to save us…. Love The story of your geese – beautiful comment Rebecca – I think you’re so right, when that awakening occurs, we see every form of life in a different light, and that’s part of what Anatole France was referring to in those lovely words you quoted….. I do so love to read your work. Never doubt for a moment that you are moving people with your words. You move me. I belong to a group called Writer’s Harbor on Facebook and would like to share your posts with them because I enjoy your writing so much. Please let me know if that would be okay with you. You always send me such beautiful words, and I value them greatly. I know you always understand the meaning in my writing,and it gives me such heart. Thank you, thank you dear friend. I’m honoured and touched that you would want to share my writing with others, and can only say thank you and of course ! I’ll click on that link and see what it’s all about … the internet is a constantly expanding experIence for the likes of me! We are so utterly blessed to have these creatures in our lives. Well, some may not bless the possum or the hedgehog but ,as you say, we are all fellow travelllers and we all must work out how to make our way in the world that we share. Yes, it’s sad that the possum and the hedgehog, so beloved in their countries of origin are now reviled in this country where they didn’t ask to be introduced . I treasure them in our gardens where they eat the snails and slugs and keep the garden free of pests, I know in the wild, it’s another matter, alas for everyone. What a blessing to be visited by so many wild visitors. I love your close observations of the way the birds move, and feed, and the thoughtfulness in your writing. St Francis’s prayer, which I know well, is so apt for this time. Thank you Juliet… yes, it is lovely to be far enough away from the city to be able to enjoy some wild life…and such a pleasure to know that you enjoy the blog. I’m carefully noting all the your instructions, and will gird my loins to tackle the challenge – to mix a few metaphors! I think you succeeded! At least, it’s posted anonymously, but I think it’s you. IT was – maybe I will screw up my courage and try my URL again… and hope the great god of technology doesn’t slap me over the wrist and thunder: this is not your URL !!! Valerie, your keen observations and fond descriptions of the animals around you makes me think of you as the Beatrix Potter of NZ! Very flattering, Michele, thank you… I always thing she must have been a great spiritual force disguised in her rather frumpy persona, – to be able to sensitise, and delight so many children, and so subtly influence them to respect nature was a huge achievement !! Kathy, thank you so much…so glad you enjoyed the blog… hope you enjoyed your break??? Your keen sense of observation and respect for the natural world really stands out. Your plea for harmony and peace also touches my heart, especially at this time.I too see you as the Beatrix Potter of NZ. I love how you write, Valerie! I like to think the world of animals and insects and fowl are actually being gracious and sharing with us–I agree with Henry Beston! I also think the day will come when we all know and will be stunned at how horrible we have treated these gracious creatures. Dear Linda – thank you. I absolutely agree with all that you say… I know we both feel the same about the world and its creatures… so good to hear from you dear friend. Valerie your wise and wonderful observations gave me hope today. Thank you. I don’t know anyone who can write about nature like you do. I keep thinking the book you wrote “The sound of Water”. “We are all fellow travellers and all connected by Spirit.”, too beautiful! Thank you so much, Valerie! so thank you, fellow traveller !!! We are thousand miles apart, yet be able to share and connect. Thank you so much for your inspiring thoughts and eloquent writing, Valerie. My pleasure Valerie! Thanks for your kind comments! The call of birds is so intertwined in our lives–like poetry, isn’t it? Sometimes too we notice there is silence and some voice is missing from the background of our lives. Lovely words, Valerie. Thank you Alice – I love to know you’ve enjoyed those little but essential things too…yes, I find even the word bird-song is poetic ! There’s so much here, Valerie. One of my favourite prayers, a quote that speaks my animal loving heart -“They are not brethren; they are not underlings: they are other nations, …” – and tea with you as we peeked out windows. Thank you for taking the time to notice, and then describe, even the twitch of a contented tail. 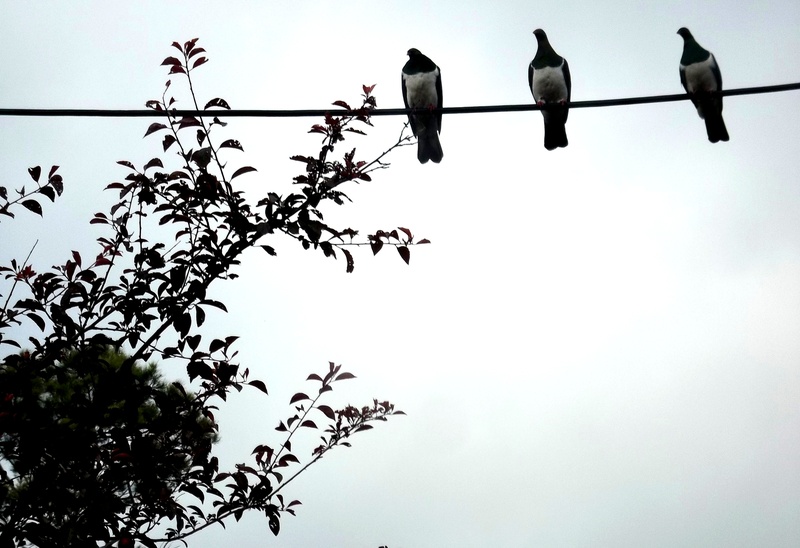 I know it’s not funny, but when I was in New Zealand, it became obvious the wee Tui has a rather mischievous streak. People shooed them away from the rubber trim on car windows near Milford Sound! Hello Amy, thank you for your lovely perceptive comments, I’m so fortunate to have readers like you.I love it when you notice all the little things in the blog…. I know the birds you’re thinking of – they’re called keas – and are a sort of parrot, and are absolutely wicked – as you say, ripping the rubber off round windscreens, trashing people’s haversacks, – they’re famous for it !!! How long were you in NZ ? – I expect Milford Sound felt a bit like Canada, did it? St Francis has always been a favorite of mine – could it be I attend St Francis Catholic school?! 😉 So many prayers to bring peace and the presence of God in our lives. Yes, Patti, who can resist St Francis !!!! We should all strive to have his pure heart. Thank you Sally! We have ducks in common too!!! How beautiful – The Prayer of St Francis! What a lovely post!! Thank you!! Thank you Tersia … you can’t improve on those words, can you !!! What a beautiful post! Love how you move from the pigeons to the sheep and other birds and on to the quotations, each time going deeper and deeper . . . and then ending with the poem. Perfect! are speaking about! Bookmarked. Please also viit my site =).